Winter weather in April is part of life in northeast Wisconsin. Many businesses say they've come to expect this. GREEN BAY, Wis. — Winter weather in April is part of life in northeast Wisconsin. Many businesses say they've come to expect this. Last year around this time, the Green Bay area was dealt more than 2 feet of snow. So, these couple of inches isn't a big deal, but it's still forcing some businesses to react. A quick round at Hilly Haven Golf Course, for example, will have to be enjoyed inside on a simulator this week. 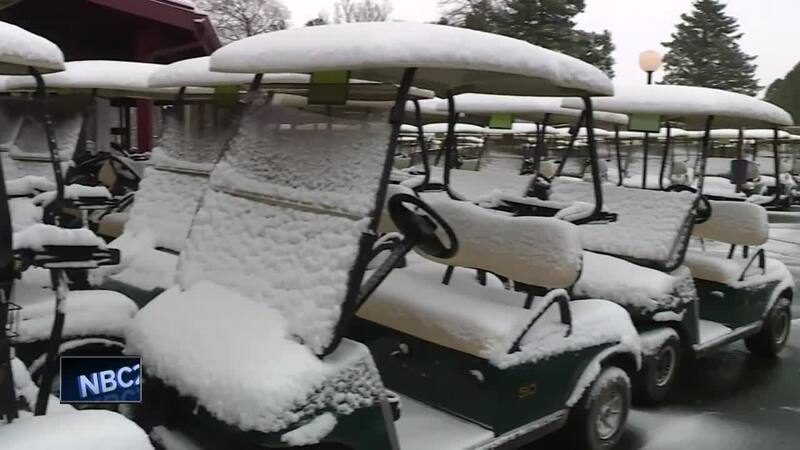 "We got the carts on the course on Sunday. We had a couple nice days until this snow storm hit,” says Charlie Demske. Demske, who manages the grounds, dealt with the parking lot Thursday, because no one is going to get a quick round in during this weather. "Monday was nice and busy,” says Demske. “70 degrees and we had short sleeves on and guys riding around on golf carts the whole course." Now, just as last year, April golfing was interrupted by a snowstorm. "In this kind of climate, it does happen," says Demske. When the area continually experiences April snow storms, year after year, other businesses have started tweaking their game plan for operations as well. "It's to be expected as it is Wisconsin, but you know it's not fun for anybody," says Ted Zieman at Zesty's Frozen Custard. Zesty's Frozen Custard in De Pere traditionally opens shop the first week in April. But after living through last year’s April storm, they pushed their opening date back because of what could mess with their frozen custard sales. While there's no changing Mother Nature’s business plan, it seems businesses across northeast Wisconsin are getting accustomed to being at the mercy of another snow storm, even in April.